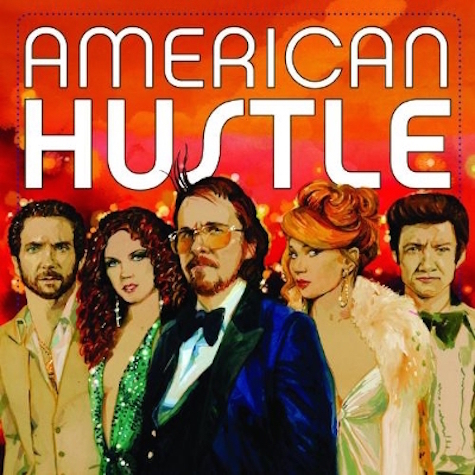 Album sleeve for the upcoming vinyl release of the American Hustle soundtrack. Went to Feature VI last night at the Holland Center, the fund-raiser for Film Streams featuring directors Alexander Payne and David O. Russell. I love all of DOR’s movies (and some of Payne’s). Among the highlights was Russell showing off a double-colored-vinyl release of the soundtrack to his last film, the sublime American Hustle, which isn’t available until Black Friday Record Store Day, Nov. 28. It is indeed an impressive looking package, though someone has to teach these guys the proper way to treat vinyl. I cringed as Russell grabbed the colored vinyl from the sleeve and then began blowing/spitting on it and brushing it with his fingers. DJ Payne cued the tracks on a portable turntable, starting with a Duke Ellington number. Nice. But when he decided to change songs, he scraped the needle across the surface, dropping it over and over until he found the groove for an ELO song. Come on, man! Yesterday we got word that Brendan Greene-Walsh, the long-serving booker and sound man at America’s favorite divebar / rockclub, O’Leaver’s, is hanging up the reins. Tonight at The Slowdown it’s the return of New Pornographers. Tonight’s line-up is stellar, featuring A.C. Newman, Neko Case and Dan Bejar. The Pains of Being Pure at Heart, who would be a hot-selling ticket all by themselves, is opening. $28, 8 p.m.
Also tonight, The Down Under continues its recent streak of shows with punk bands Charlie Siren, Let Yourself Go, Buggy Lewis and the Rabbit Grenades, and Wake the Neighbors. $5, 7 p.m.